Whatever Happened to the Islamists explores how politically engaged Muslims are addressing and adapting to these challenges in changing climate. Instructive and entertaining, this book is a collection of essays assessing the gradual evolution of an ideology through the diverse contemporary facets of what is commonly referred to as “political Islam”. Following a three-fold track, the authors first discuss the mutating nature of political involvement, that is to say a change in the traditional classification between overtly political Islamists and supposedly a-political Salafi movements. Second, it considers how the abandonment of traditional structures of religious hierarchy is leading to a process of deinstitutionalization and decentralization. And third, the Islamic adoption of new media: an unfolding arena where the message is spread using new technologies, from the e-jihad by the Egyptian Muslim Brotherhood youth to Muslim pop idols or comedians, and in so doing, how the old ways of Islamist activism are making room for alternative modes of production and diffusion of ideas. To map this wealth of diversity, Whatever Happened to the Islamists is divided into three groups of chapters. The first part asks what is left of the old Islamist ideas, starting logically with the debate around the very notion of “Islamism” and its political identities. Olivier Roy and Roel Meijer, clearly lay out the groundwork and narrate how the scholar of Islamism ends up besieged; on his left, progressive critics who consider him as a post-colonial neo-Orientalist and, on the other side, culturalist right-wingers who see him as a useful Idiot, as Lenin put it. To add weight to this theoretical approach, the chapter of Mohamed Mosaad Abdel Aziz guides us through the current shifts of the Muslim Brotherhood in Egypt, and Jean Marcou describes the Justice and Development Party (AKP)’s gradual conquest of the main centres of power in Turkey. The second part tackles the “new Islamist landscapes” with an analysis of the disengagement of Islamists in Europe by Amel Boubekeur, the historical trajectory of Political Islam in West Africa by Muriel Gomez-Perez and the Netherlands version of Salafism by Martijn de Koning. 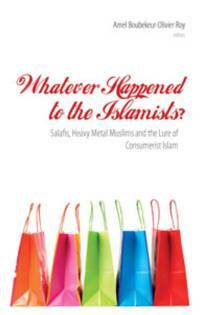 The final part of this book offers a glimpse into how new forms of Islamism are entering the daily lives of Muslims. Valentina Frate describes how veiled Egyptian artists are increasingly embodying and serving as new living icons, competing with Western or nationalistic representations of beauty. Mark LeVine tackles the artistic rise of a post-Islamist public sphere, and Patricia Sloane-White analyses the trajectory of corporate Islam in Malaysia. Whatever Happened to the Islamists is indeed a rich melange, but with a clear direction: how Islamists and their fellow activists are adjusting to national and global changes. And how we can understand these transformations. There is no doubt that the layman will find himself compelled to broaden his vision and realize the diversity and range hiding under the Islamist carpet. Conversely, it is also very likely that the specialist will find a refreshing mapping of the current conversation and the trajectories of a hotly debated political specimen.